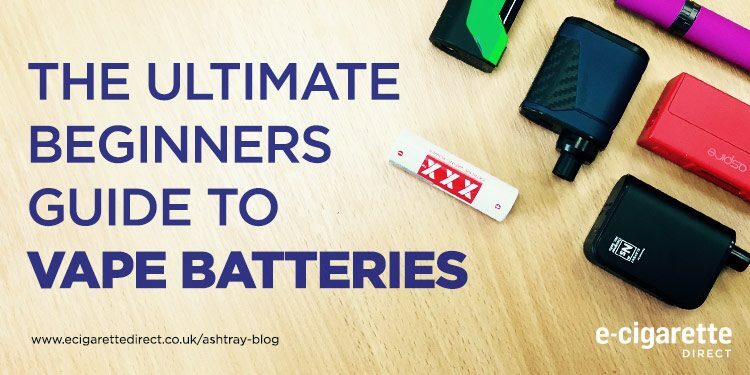 From avoiding exploding batteries to maximising the life of your vape battery, this guide covers everything most vapers need to know. We’ve partially based this guide on dozens of customer questions we have received over the years, but if there is anything you want to know which is not covered in this guide just leave a question in the comments! One area we don’t cover is unregulated mechanical or rebuildable mods. This area is well covered by niche websites, but as many of them warn, if you don’t know what you are doing they can be dangerous. If you are a modder, you will know where to find the information you need! You’ll find information here that all but the beginning vaper will know, as well as more advanced tips, so you may find it useful to use the menu below to navigate to the information you need rather than read the whole article. Don’t have time to read the whole post? 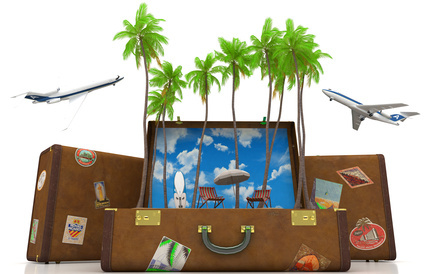 We’ve condensed down the best tips on this post in to a concise, printable and saveable pdf. Click below to download! Automatic batteries were once the first type of e-cig new vapers would try. The most cigarette-like vaping batteries have automatic operation, but the performance is generally better with manual options. But what do these terms mean? 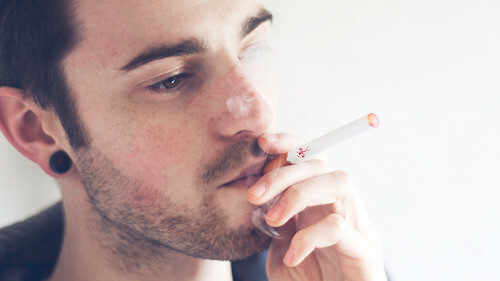 When you inhale on a cigalike with an automatic battery, a sensor detects the rush of air and activates the battery. However, with a manual battery you depress the button to activate the battery. This might seem less convenient but it’s something you get used to really quickly, and it gives you more control over your draw. May need a few short puffs to let the coil heat up before your main puff. Variable voltage or variable wattage batteries are the next step up from a manual battery. These allow you to increase or decrease the voltage provided by the battery, usually by pressing a button or by twisting the end of the battery. There are two common types of variable voltage battery on the market today. 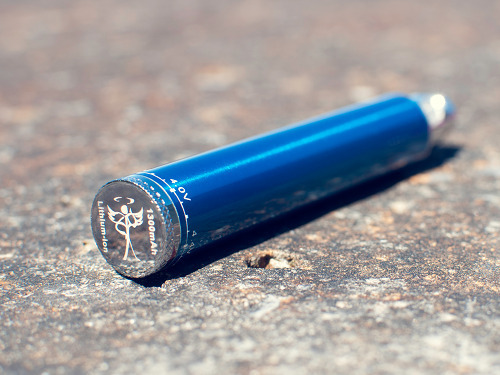 Options like the Vision Spinner could be considered variable voltage vape pens, because they have a tube shape in the same way as simpler manual batteries. The other major group is variable wattage mods (like the Coolfire Ultra TC150), which tend to be boxy in shape and have buttons to control the power (i.e. the wattage) going to your coil. The benefits of these are the same as variable voltage devices, but they feature much bigger batteries so you can use them for a lot longer without having to recharge them. 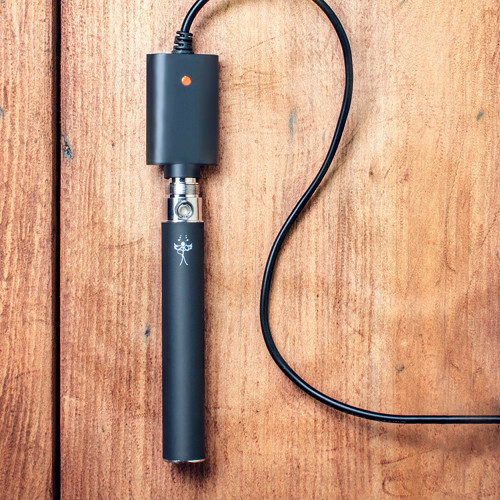 These are more advanced but they do offer tons of benefits if you’re serious about switching to vaping. When you use a variable voltage battery with a device like the Aspire Cleito Exo or the Smok TFV8 Baby, you can control the experience even further by changing the resistance of the atomiser used in your tank. For more information see our Guide to Tanks. There aren’t any comparable charts for sub ohm (i.e. resistance below 1 ohm) coils, because the acceptable range varies quite a lot, but most companies suggest settings on the coil itself. As many vapers disagree on the exact best matches, and it can vary according to the material used to make the coil, these guidelines are usually the best place to start. Many variable wattage mods have internal batteries as part of their design. However, not all of them do, and for some devices you need to purchase a battery or batteries separately to the device. There are many sizes available (including 21700, 18350, 22650 and many others), but 18650 batteries (like the Extreme Vaping 18650) are the most commonly used ones in vaping devices. Most of the time, having a separately-bought battery doesn’t have any impact on your experience at all. A mod powered by one can still do all of the same things an internal battery mod can do. The only difference is that you have to insert your battery or batteries in the right polarity (in accordance with the “+” and “−” signs found on the battery slot), and in some cases, charge your batteries on a purpose-built battery charger such as the Nitecore Intellicharger 2. Many mods do allow on-board charging of separately purchased batteries, though. Although using separate batteries may seem a bit more complicated or hands-on than using devices with in-built batteries, there is very little difference at all in practice. There are benefits to this approach too: you can take spare batteries if you’re going to be out of the house for a long time and you can also upgrade your battery without having to buy a whole new mod. 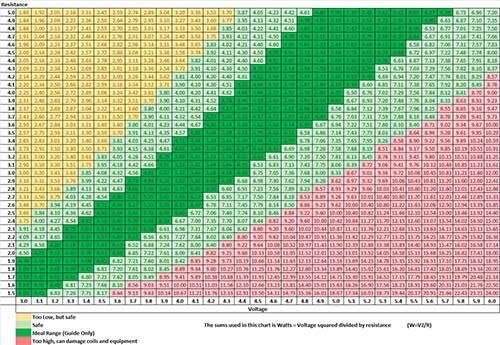 For a more advanced guide covering variable voltage, variable wattage and sub-ohming click here. One of the things that confuses many new vapers is the difference between battery capacity and voltage or wattage. Battery capacity is a measure of “battery life” on a single charge. The capacity on electronic cigarette batteries is normally measured in milliamp hours (mAh). The higher the mAh rating, the higher the capacity of the battery and the longer it will last between charges. Most non-adjustable vape batteries output 3.7 volts. A battery with a capacity of 1100mAh will be able to output 3.7 volts for longer than a battery that has a capacity of 180mAh, but both can put out the same voltage. The voltage essentially tells you how much current the battery can send out to your coil. For the same resistance, a higher voltage will send more current (and more watts) to your coil and it will produce more vapour as a result. There is a link between voltage and capacity because vaping at a higher wattage will produce a higher current and that will reduce the amount of time you can vape between charges. The milliamp hour rating (mAh) helps you understand this: more voltage means more milliamps, and more milliamps means fewer hours running. You can have your battery working for one hour (only counting the time you’re actually taking a puff) if you vape at 1 amp (i.e. 1,000 mA) on a 1,000 mAh battery. What kind of battery life can you expect? For example, a battery will last a lot longer for someone who takes short drags than for someone who takes very long drags. If you maintain your device better, the battery will last longer between charges. And if you use a lower-resistance coil, you’ll have more power going to it and so the battery won’t last as long. For variable voltage/wattage mods, the huge range of possible settings makes it virtually impossible to estimate how many puffs you’ll be able to use it for between charges. There is such a big difference between vaping at 20 W and vaping at 80 W that the variation in the number of puffs would be massive. However, you can safely assume you will be able to vape for a whole day on a single charge of any modern variable wattage box mod, and more for higher-capacity batteries. 1. Initial Charge: Give your battery a good first charge when you receive it. Most vape batteries are lithium ion batteries and can not be overcharged. However, a good initial charge conditions the battery and will help ensure a longer life. 2. Storage: Store your battery in a cool, dark place, especially if storing for a long period of time. If you do plan to store the battery for a lengthy period, try to make sure it has at least a 40% charge. This allows for some discharge while ensuring enough power is retained to keep the protection circuit alive. Some sites recommend fully charging batteries before storing. 3. Use Regularly: Most ecigarette batteries are designed to be used daily. 4. Charge Before Fully Drained: Battery University argues that a partial discharge stresses the battery less than a full discharge. It might not always be possible, but if you can charge your battery before it is completely empty you should improve its lifespan. With variable wattage devices, vaping at very high wattages (close to the maximum on your device) will also put strain on the battery if it’s nearly empty, so this is another reason to charge sooner rather than later if possible. 6. Take Care of your Battery: See maintenance tips below. 7. Turn off when not using: Especially important if you are carrying the battery in a bag or in your pocket, as sitting on it can cause the ecigarette to fizzle away. This not only drains your battery but it could also ruin your coil. 8. Keep out of high temperatures and direct sunlight. If your battery gets too hot this can contribute to wear and tear, thereby reducing the lifespan. 9. Use a case to protect your battery: Batteries can get banged around and pick up fluff in pockets. For the best possible care, carry your battery in an vape case. You can see examples of carry cases here for manual batteries on our e-cig accessories page. If you’re carrying a separate battery for a mod, it’s very important to keep it in a plastic case so it doesn’t touch something metallic in your pocket and cause a short. If you’re like me, you might also want to avoid placing your vape battery on the sofa next to you – I have broken several batteries this way! Lithium ion batteries are highly effective at producing power despite their small size. Unfortunately, the properties and chemicals used in a Lithium ion battery also mean that any lithium ion battery has the potential to explode. Contained within a lithium batteries are lithium, sodium, potassium and other highly flammable and volatile elements. If you tossed these into water on their own you would get an explosion. When a cell does overheat, it can lead to a chain reaction which can cause either battery swelling or explosions. Fortunately, modern design means that explosions are very rare (an estimated one in ten million according to Battery University). However, explosions can be caused by an overheating battery.. This can be caused by a defect, such as a short circuit or improper insulation between the cells of the battery or by mishandling. If there is a short circuit inside the battery, this allows current to flow, which produces heat and damages the insulation, and thus makes the problem worse. After the battery reaches a certain temperature, this breakdown can’t be stopped and the battery could go into “thermal runaway” and either explode or vent hot gas. Again, though, it’s important to stress that this is a very rare occurrence, especially if you use your battery safely. As additional protection, there is a fusing system built into the battery which is designed to blow should a battery overdischarge, and a circuit behind buttons limiting the amount of time the battery can be activated at any one time. It’s important to note that it’s highly unlikely you will get a battery explosion. Most problems in the past have occurred when vapers have modified their own batteries, and modern vape batteries comes with a number of safeguards built in. Only charge a battery with the charger that was provided with the battery, or which has been specifically supplied for that battery. While chargers may look similar, the voltage output can be different. Charge a battery from one supplier with a charger from another supplier and you could cause problems. In fact, as the fire service has pointed out, this has caused most of the problems so far. Aside from short circuits, this is the most common cause of explosions on E-Cig One’s comprehensive list too. If you don’t have the original charger that provided with the battery, the most important thing to look at is the voltage output of the charger. This has to match the input voltage on the battery you’re charging. The current (in amps) should ideally match too, but since the device you attach only asks for as much current as it needs, having too high an amp rating on your charger isn’t too important (although it may reduce your battery’s lifespan over a long period of time). The good news is that most e-cigarette batteries are charged by USB, and almost all USB chargers have the same characteristics (5 V and 500 mA). They may have higher currents, but in most cases this doesn’t matter too much (as explained above). However, if at all possible, use the charger that was originally supplied with your battery to prevent issues. One battery explosion occurred in the US when a vaper bought cheap batteries online to use with his ecigarette kit. Always buy your batteries from a reputable source. In the UK many companies are certified by ECITA, which require companies to test their products – while these are not the only reputable companies out there, the ECITA logo is a mark of quality. Don’t charge your battery over night or when you are out of house. For safety, charge your battery on a non-combustible surface. If you have a manual battery, switch it off before charging. Check with your supplier to make sure your battery has overcharge protection. Our batteries come with overcharge protection, and we also individually test batteries from each battery to ensure overcharge protection is working. If you use a mod that takes separate batteries, carrying the batteries safely is absolutely essential. Without a plastic case, keys, coins or other metallic objects in your pocket could touch the terminals of the battery and cause a short circuit. The cases are very affordable, but if you don’t use one you risk a battery explosion, so you should always use one when you carry loose batteries in your pocket. For more information, see our infographic: The 10 Rules of E-Cig Battery Safety Infographic. Clean Battery Terminals – nothing complicated here, simply screw up some tissue paper and give the terminals a rub. A cotton bud can be used if harder cleaning is required. For the most effective cleaning, use cotton swab soaked in rubbing alcohol to clean the terminal. Allow the battery a few seconds to dry before using. Keep Batteries Charged – as explained above, keeping some charge in your battery can extend the life of your battery, especially if you go some time without using it. Switch the battery off when not in use. Avoid a full discharge before storage. Aim for around 40% charge if you’re storing for a long time. Store batteries at low temperatures. 1. Check the cartridge or tank is not empty. If you are using a tank you can easily see the level of eliquid, if not, you may need to try another cartridge to be absolutely sure. 2. Ensure battery terminal is clean. 3. Ensure tank/cartridge thread is clean. 4. Ensure battery terminal is connecting with the tank/cartridge. 6. If using a sub ohm tank such as the Cleito Exo, try changing the head of the tank. 1. Gently tap the led side of the battery on a wooden surface. 2. Remove battery from the tank/cartridge and inhale and exhale from the battery. 3. Blow gently at the LED light (for cigalike devices). 4. Allow battery to completely discharge and then recharge. This should be the last step as allowing the battery to discharge completely is not good for the battery life. If all troubleshooting steps fail, you may need a new battery. If your battery is relatively new, check your warranty, as most batteries come with a guarantee. Assuming the battery has recently been charged, try leaving the battery for 24 hours at room temperature, and then recharging it. You should also make sure the battery terminal is clean and free from fluff – if not, give it a rub with a piece of tissue, a cotton bud or an alcohol wipe. Want to take your knowledge to the next level? These guides will help. Temperature Control Vaping: Find out how to control the temperature of your coil for a more consistent flavour and fewer burnt coils. Sub Ohm Vaping: A Beginner’s Guide: Learn how to blow massive clouds of vapour! The Vaper’s Guide to Voltage, Watt’s and Ohms: A more in-depth tutorial on key battery terms, split into beginner and advanced sections. Finally, if you found this guide useful, and thinks others may too, please share using one of the share buttons below! Missed my calling, I did. Should have been a proof reader. Do feel free to delete this comment post-edit; it doesn’t really contribute anything, just a heads-up. Great work as usual James, thank you for such a comprehensive guide! Funny that you mention the dangers of leaving batteries on the couch. I’ve never broken any by sitting on them but I swear my couch is addicted to swallowing e-cigarettes in the cracks between the cushions. Whenever I can’t find mine it’s nearly 100% sure that the couch has gobbled it haha. Beauty of e-cigs is that if you doze off and drop one you will not end up with burn holes in your sweater! As I’m not on facebook I can’t leave a comment on your excellent battery guide so I will leave it here instead. I habe had problems with a dead battery in the padt; the battery is chargef, tetminals squeaky clean and well connected to the clearomiser bit and no joy, the red light even comes on! In this sitiatiom you cpuld solve the problem by disconnecting the battery and with a hairpin or something that wil fit under the battery contact, very gently lift the contact a little on both sides of it. The contact, with use and over time, can become compressed a bit making contact with your clearomiser impossible. This little trick has worked for me many times, just be very gentle and very careful when ‘lifting’ the contact-it only takes 1mm or so. Good luck! Apologies for the typos in my previpus post; I am doing this on my phone and cant see what I’ve typed! Thanks for the comment, and don’t worry about the typos – I make enough of them on a standard computer! You sound like you know what you are doing with batteries. The only thing I’d say is if it is in the warranty period you might be better off getting a replacement battery, as if you had made adjustments to the battery the warranty may become invalid. i got mine charged and works well prob is after a few drags the middle gets a bit worm and not sure what to do im charging it now but dont think it need it just trying alsorts? What device are you using, Darren, and how long have you had it? Thanks for the guide, it has helped a great deal! I’m buying one for a dear friend for Christmas and this has helped. I’m a former smoker, quit cold turkey 22 yor sago and still miss it once in awhile, am even considering getting one for very ocassional use for when I’m craving a puff lol. I’ll be printing it off for her to include with the package along with the web addy so she can easily buy the refills when needed. thanks again! 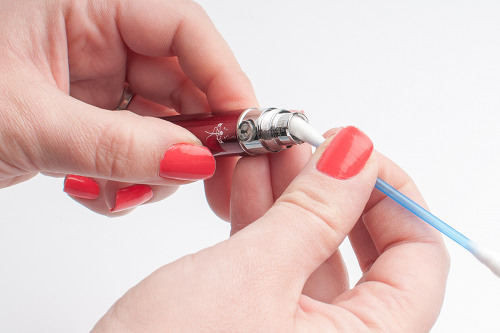 So glad you found it useful – let me know how your friend gets on with her ecig! just for info – ROHS certification does not mean the battery has been tested. It refers to the restriction of hazardous substances used in its manufacture. So ROHS compliant product does not have certain things in it (e.g lead, chromium 6 etc) that could appear in the waste stream when discarded. Because it’s ROHS compliant doesn’t means it has any safety testing…..
i am using a coil everyday, what is wrong ? Hi Callum, it’ll still be under warranty, I’d send it back to VIP. What if the top comes off the batterie? Definitely don’t continue to use! Again, you should sent it back to the seller and ask for a replacement if it is still within the warranty period. Hi Aimee, are you using the cigalike or the tank system? I was wondering If I could get some help. I recently bought an X6 Ecab V2. I’m kinda new to this stuff and I think something is wrong. The day I bought it, I used it a normal amount. However I found that the coil was starting to burn the wick. So I took it apart and I was getting a burning taste. I’ve fixed the burning taste but now my battery just keeps flashing 3 times everytime I press the button. When I try to charge it, the charge light stays green. I don’t know what to do. Hi Austin, there are so many e-cig types around now it is impossible to know every device! On the coil burning issue I suggest you check out this post: https://www.ecigarettedirect.co.uk/ashtray-blog/2016/06/stop-coil-burning.html, while on the charging issue I would suggest you get in contact with the supplier. i have screwed the battery on to the aquamiser but can not unscrew it. think iv screwed it on to tight, any one got any tips on how to unscrew it please. Yes, you might one of these solutions handy. 1. Pop it in the fridge for a couple of hours, this can sometimes help. 2. 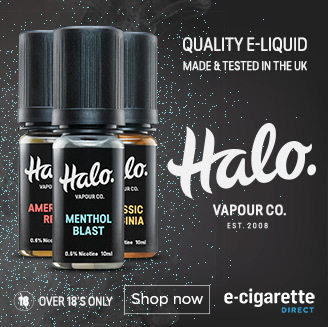 Try using a vape band (like this https://www.ecigarettedirect.co.uk/halo-e-cig-vape-band-silicone) to give you traction. Failing that, pliers usually do the job. The power light is continuing to stay on even after trying to power off anybody got any ideas on how to fix this? I’m a little lost with the resistance table… Pretty sure I need a better battery, but I’m not sure where to start. I’m using a Subvod battery, which is 3.7V, and an Aspire Cleito coil, which says 0.4 ohms on the side of it. Is that just too low-end for the table, or am I missing something? It was my understanding that I need a more powerful battery with this coil, but the table says otherwise. Hi Jonny, we’ve moved away from the resistance table since we wrote this post. There are many variables including the material the coil is used for, and we suggest checking the manual for suggestions and a bit of trial and error (cranking the power up until you get the perfect hit).